Between December 2011 and June 2012 the numbers of torchbearer places being awarded by bodies other than the Presenting Partners and LOCOG increased by a third. The International Olympic Committee‘s share of places saw the biggest change, going up by half – from 71 according to a December press release to 117 six months later, while commercial partners other than the three presenting partners – dozens of companies including Dow Chemical, G4S, Atos and BT – saw their share go up from 678 places to 913. The British Olympic Association (BOA) was explicit in an internal document that its 250 places were not part of the 90% of places available to the general public. Five each went to over 40 national governing bodies (NGB), who were given instructions – underlined and in bold – “We strongly urge you to seek the voice of your athlete population for your nominations.” The criteria for NGB torchbearers was specific: three athletes, one of whom must be a past Olympian, and two volunteers, officials or staff members from the governing body – one of whom must be aged 12-24. “Each Torchbearer, regardless of the nominating organisation, must be nominated by another individual” and that they must satisfy particular criteria including knowing “the importance of fair play”. Many of the other bodies distributing torchbearer places, however, seemed less stringent in their criteria. As users of the Help Me Investigate website analysed torchbearer data they noticed a recurring pattern. Time and time again, corporate partners allowed individuals to nominate themselves to carry the torch, with stories that made no mention of the criteria set out by LOCOG, or nomination stories that have never been published. And LOCOG’s guidance not to select executives was consistently – and publicly – ignored. At Aggreko, for example, which held a £50m contract to provide temporary energy to the Olympics, four out of seven executive directors were carrying the torch – as well as the Chief Executive’s PA. One of these directors was Kash Pandya – the ‘guy from Dubai’ running in Jack Binstead’s borough. His nomination story said he ‘contributed to the community’ by supplying developing countries with electricity. As Regional Director of Aggreko International, that was his job. It was how the company made money. Within adidas, torch places were allocated to senior executives at corporations the sports company had business relationships with – including the man named the 15th most powerful person in retail. Eight nominees were given an identical nomination story. One senior executive’s two children got to carry the torch – but neither mentioned the company in their nomination stories. Other stories mentioned their nominee’s sales performance or “money in the till attitude” – but nothing about contributing to the community. 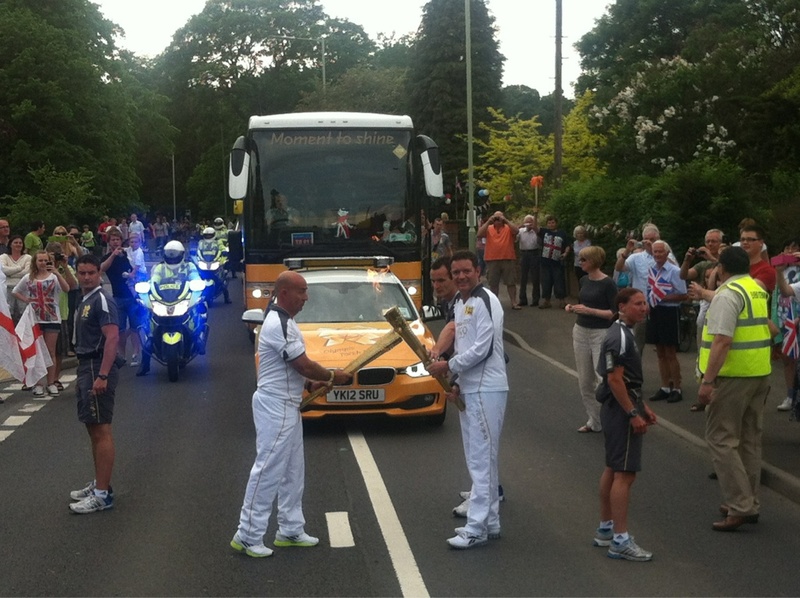 One pair of executive torchbearers even got to enjoy their own corporate ‘Kodak moment’, as the general manager of Intersport UK and the Group Product Director for Next exchanged a ‘torch kiss‘ in Stafford. It was an 8,000-to-one shot that the two adidas nominees – both of whom lived over 40 miles south of the town – should carry the torch on consecutive legs of the relay: LOCOG insisted that no one could choose where they carried the torch. Coincidentally, a 17 year old local hurdler nominated by UK Athletics was due to carry the torch on the same day – but had been dropped two weeks previously for ‘failing background checks’. His mother – already devastated by the decision to withdraw his place – was incensed by the revelation. Similar stories came from ArcelorMittal, where the chief executive Lakshmi Mittal – the richest man in Britain – carried the torch with a nomination story comparing himself to an Olympian. His son, the head of mergers and acquisitions, carried it with a nomination story about overseeing a corporate takeover. These included celebrities such as Will.i.am and Jamie Oliver (Samsung) and sportspeople including swimmer Mark Foster (Lloyds TSB) and Didier Drogba (Samsung). But outside of the spotlight, torchbearer places were being given once again to executives, commercial partner bosses, and sponsorship campaign team members. Places went to the MD for Samsung Mobile UK and Ireland; the Chief Operations Officer at Samsung Africa; the President and CEO for Samsung Canada; the President and CEO for Samsung in Southeast Asia, and many others. Their names – like those of so many executive torchbearers – later disappeared from the London 2012 site. At Coca Cola places went to Vonta Vontobel, the president of the Brazilian Bottlers Association of Coca-Cola, and Xiemar Lopez, the director of Coca Cola Brazil. Alongside the executives were a cluster of PR, marketing and communications staff – the very people overseeing the sponsorship campaigns. EDF selected the group’s former director of HR and communications. BT selected a senior marketing manager, and BP selected Carl Halksworth, the creative director of Landor, their design agency partner for the Games. The people who had designed a range of pin badges for Coca Cola’s London 2012 campaign and the Coca Cola pavilion at the Games were also included. Three people from the Olympic Broadcasting Service and an account manager at Vodafone were among those identified by the Bournemouth Echo; the creator of a film used by the London 2012 team when bidding for the games was identified by the Argus in Sussex. At Lloyds TSB sponsorship manager Camilla Grove would carry the torch. And Samsung nominated PR worker Jeoungeun Ahn for “writting [sic] stories about volunteer works of her colleagues.” It’s not clear if her colleagues were nominated themselves. “People were asked to tell us, in less than 150 words, about the difference the person they nominated made to their community and how they inspired others. All nominations were reviewed, a shortlist created and Torchbearers were selected at random from that shortlist before being submitted to LOCOG for approval. With over 100,000 employees these outstanding people make up 0.2% of our staff base”. As the places were passed on, the links to the original torchbearer criteria seemed to grow fainter. The deputy editor of a Russian newspaper accepted a nomination from Coca Cola; the owner of a chain of shops in Ukraine from Samsung. In Bridlington in Yorkshire, locals were so frustrated by a Saudi Arabian entrepreneur carrying the torch that they organised their own alternative, with a torch being carried by a quartet of locals whose nominations had been rejected: a disabled long jump star, an athlete, and two members of the town’s fencing club, including still-competing 78-year-old Joy Fleetham – but the relay was called off when the local council said it could not support it. In Merton the Wimbledon Guardian organised its own alternative relay when it emerged that not one person running in the local leg of the official Olympic Torch Relay was from the borough. Their torchbearers included “two former Olympic champions, a 2016 Olympic hopeful and an 86-year old marathon runner who has raised thousands of pounds for charity.” The biggest alternative relay of all – the Real Relay – had raised over £11,000 for charity by mid-July, when organisers of the official Olympic Torch Relay banned one official torchbearer from wearing a ‘Help for Heroes’ charity wristband. It had already required local authorities to sign contracts forbidding them from using the relay to raise money for charity. Jack Binstead’s mother, meanwhile, was trying to raise funds of her own. “It has been quite trying up until now,” she explains. “We have had to rely on sponsoring him ourselves: running races, trying to raise money, because it is a very expensive sport. His chair alone is £3,500. As more and more stories emerged of powerful individuals carrying the torch with less than inspiring nominations, the Times Higher Education Supplement reported on a cluster of university vice chancellors “getting in on the act”. Samsung had given three places each to 31 universities with the instructions that one place go to a senior member of staff. At Nottingham Trent, Manchester Metropolitan and Leeds Metropolitan universities, vice chancellors and pro vice chancellors obliged and carried the torches. At Brunel, notably, the vice chancellor felt that carrying the torch would be inappropriate, and another member of staff, Ian Campbell, was instead nominated for his 20 years of volunteering to organise Paralympic sport. But the growing suspicion around torch relay places meant that his name was still included in the Times Higher Education Supplement piece. There was a further South Korean connection in the nominations of the country’s ambassador to the UK, and the former British ambassador to Korea: Martin Uden. Olympics minister Hugh Robertson had said at the torch relay’s launch that “The last thing the Olympics needs is a middle aged, overweight politician to run with it” – but he had said nothing about diplomats. Admirably, The International Olympic Committee gave 57 of its 117 places to members of the World Food Programme. Of the remainder, many went to senior members of the IOC itself, such as Richard Carrión, chair of the finance and audit commissions, and a member of the Marketing, TV and New Media Rights Commissions, who would carry the torch through Westminster without a nomination story. But the organisation also, as the Korean Joongang Daily explained, “traditionally selects runners from among reporters”. One of those was Chun Su-jin, a reporter covering the Games for JoongAng Ilbo. The Joongang Daily piece explained that Su-jin had to undertake an examination process by LOCOG, who “requested Chun answer several questions in 34 different categories including ones pertinent to her physical condition”. They don’t say if the questions asked about her contribution to the community, but her nomination story does not mention one – instead focusing on her excitement about reporting on her country’s biggest Olympic star (since removed). Also reporting on the Games after carrying the torch would be Gao Dianmin, director of the London Bureau of Xinhua and member of the International Olympic Committee press commission. In Royal Tunbridge Wells another IOC press commission member, La Gazzetta dello Sport reporter Giovanni Merlo, would carry the torch, as would Daily Mail Chief Sports Writer Patrick Collins, while The Scotsman’s Chief Sports Writer had already carried his torch through Dumfries. The IOC wasn’t alone in nominating journalists. Reuters’ Paul Radford, also a member of the IOC press commission, was nominated by LOCOG chair Sebastian Coe. Sports journalists from Nigeria, Brazil, China and Poland would carry the torch, as would two from The Sun: Vikki Orvice, who was nominated after she survived cancer, and boxing reporter Colin Hart. Along with Vikki, the BBC Sport’s Head of Major Events, Dave Gordon was one of the few journalists to report on his own involvement, despite not being listed on the official site. This story was enough for LOCOG to approve his nomination to carry the Olympic torch – but it was not published. Listed on the official torchbearer site before disappearing once they had carried the torch were Sky‘s head of Broadcast Networks; the Chief Executive of the Financial Times; and the Acting Group CEO of the South African Broadcasting Corporation. Executives at NBC in the US and Channel Nine in Australia were still to carry the torch. “What surprised me when I asked the organisers about the runners was that they patently had no information apart from the name – and a number of people were expressing great surprise that no ‘local heroes’ had been chosen. The woman behind me said she knew of a number of people who had been nominated and not contacted. The Bournemouth Echo and the Argus in Sussex also asked questions of those running through its region and found executives taking places which could instead have gone to people like Sophie Wells, a 13-year-old disabled girl from Eastbourne, nominated to carry the Olympic torch by her swimming teacher. Or Simon Melaniphy, who was nominated by his father for his inspirational activities as a Prince’s Trust mentor, small business owner, and fundraiser for the British Heart Foundation. Single mother Julie Drake was nominated for her work “inspiring her community” in Brighton. Her nominator, Shani Hart – “presumed whoever got it was in a better position”. One Russian technology company executive ran with the story of a theatre director; another disappeared from the official list, only to be replaced by what appeared to be a relative from the same Slovakian telecomms firm. Fewer and fewer people were believing them. In Brighton Shani Hart told the Argus: “Having sponsors carrying the torch is not what they made the torch relay out to be.” And it wasn’t. The final part – 8,000 holes – is live here. This entry was posted in investigation and tagged 8000 Holes, adidas, Aggreko, alternative torch relay, ArcelorMittal, BBC, BOA, Bournemouth Echo, Bridlington, Brunel University, Camilla Grove, Carl Halksworth, Channel Nine, Chip, Chun Su-jin, Coca Cola, Colin Hart, Daily Mail, Dave Gordon, Dorset, Dumfries, Financial Times, Gao Dianmin, Giovanni Merlo, Ian Campbell, Independent Electrical Retailer, International Olympic Committee press commission, Intersport, IOC, Jack Binstead, James Taylor, Jeoungeun Ahn, John Ridding, JoongAng Ilbo, journalists, Joy Fleetham, Julie Drake, Kash Pandya, La Gazzetta dello Sport, Lakshmi Mittal, Landor, Lauren O'Hara, Leeds Metropolitan University, lloyds tsb, Manchester Metro, Martin Uden, Merton, Michael Peuckert, NBC, Next, NGB, Nottingham Trent University, Olympic Broadcasting Service, Patrick Collins, Paul Radford, Phil Molefe, Real Relay, Reuters, Richard Carrión, Rick Whellams, Royal Tunbridge Wells, Samsung, Shani Hart, Simon Melaniphy, Sky, Sophie Wells, South African Broadcasting Corporation, Stafford, Stansted, Sussex, Sussex Argus, The Scotsman, The Sun, torchbearers, UK Trade and Industry, universities, Vikki Orvice, Vodafone, Vonta Vontobel, Westminster, Wimbledon Guardian, World Food Programme, Xiemar Lopez, Xinhua by Paul Bradshaw. Bookmark the permalink.